If you’re looking for an affordable exercise bike to add to your home gym, the Schwinn 170 Upright Exercise Bike may already be on your radar. As Schwinn’s most technologically advanced upright model, this bike has become increasingly popular with it’s combination of features and budget friendly price tag. But in a market where there seems to be endless options for home exercise bikes, can the Schwinn 170 really cut the mustard? Schwinn is easily the most recognizable name in bicycling in the world. The name is really synonymous with bicycle, kind of like Kleenex is with tissue. But does fame and popularity mean that they are always the best? That every product they produce is a winner? But if considering one of their products, you may want to stop and think how this company achieved such a reputation in the first place. For Schwinn, it’s all about history. The Schwinn bicycle heritage goes all the way back to the late 1890’s when they started developing racing bikes. This is a time when bicycling had become very popular and there was a lot of competition. Winning races was the best way to get your company name known- turns out Schwinn bikes one more races than anyone else. The Schwinn company has a pretty interesting history with all the ups and downs of the bicycle market going through the early part of the 20th century. Fast forward to the 1960’s and Schwinn starts producing indoor exercise bikes- this could’ve been due to the need to diversify, as the bicycle market wasn’t always as booming as it started out to be. Did you know Schwinn also produced motorcycles for awhile? Our history lesson is coming to an end, but I just wanted to illustrate how long the Schwinn brand has been in the game. They’ve been in the bicycle business for over 100 years and have been making exercise bikes for over 50 years. A lot of companies come and go, it happens. But when you see a company that has been around for so long, it makes you stop and think- there’s got to be a reason why they’ve been able to make it for so long, right? Is it quality of product? Luck? Maybe a little of both? Regardless, I have a feeling Schwinn is here to stay. Now back to the 170 Upright. 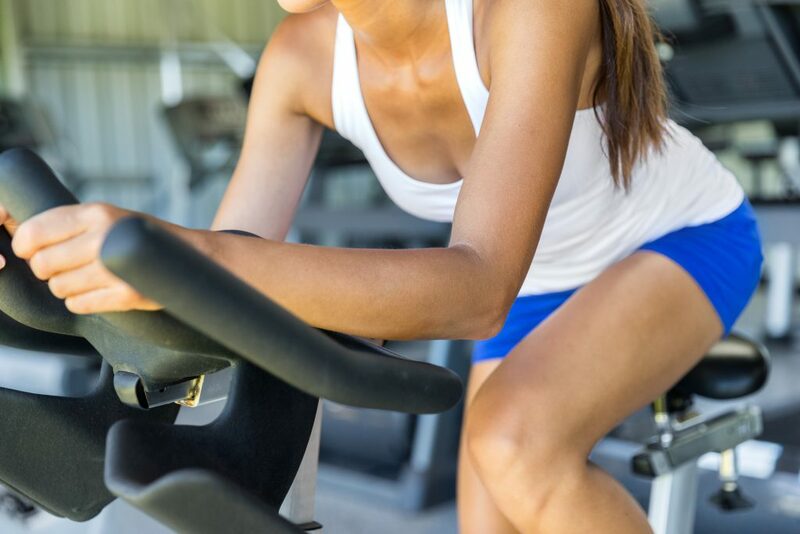 As the name implies, the 170 is a classic upright exercise bike, not a spin cycle. If you need a refresher on the differences between these bikes, check out my buyer’s guide. With an upright, you get a more comfortable (larger) seat than a spin bike and a smaller footprint than a recumbent. It’s a nice mid-ground between the two styles. With 25 levels of resistance, the Schwinn 170 gives you a lot of control over your workout. I like to remind people that more levels of resistance doesn’t necessarily equate to more overall resistance- it just means you have the ability to fine tune your effort more. That said, users have no complaints about this exercise bike lacking in the resistance department. The flywheel is only 13 lb, which is pretty light though. Heavier flywheels are usually preferred because they offer smoother, more road-like feels during use. The 170 comes loaded with 29 different workout programs. This gives you a ton of workout variety. With so many options to choose from, there’s bound to be a workout for everyone in your home to enjoy. You may never use all of these workouts, but it’s nice to know you have them if you ever want to. I wanted to point that there are 9 different heart rate monitored workouts here. I’ll get to the additional features down below, but the fact that a bike at this price has this many heart rate workouts is pretty rare. This would be a good exercise bike for folks who enjoy these type of routines. The Schwinn 170 comes with a padded, contour seat. That said, the seat isn’t the most comfortable. It is going to feel less comfortable than the commercial grade exercise bikes you may have used in your local gym. But bicycle seats are rarely comfortably. It’s really something you have to get used to. Unless you want to switch out the factory included seat with a custom one. That is easy to do on the 170 because it is designed to easily exchange with any standard bicycle seat. You could also just throw on a gel cushion- that’s what I had to do on my spin bike. The seat is fully adjustable, both vertically and front to back. This adjustability should ensure a comfortable fit for almost any user. Nothing too fancy in the pedal department here. Just a single strap and a textured surface to reduce chances of your shoes sliding. Simple, but effective. A nice feature on the 170 is the fact that the angle of the handlebars can be adjusted. They’re also padded for extra comfort during your longer rides. For a budget exercise bike, the Schwinn 170 is pretty loaded with extras. The console has 2 LCD blue backlit screens so that you can view all of the workout stats and workout profiles at the same time. The console isn’t fancy or anything, but it’s simple to use and effective. This upright bike is designed to be compatible with the RideSocial app– a program that allows you to virtually ride on trails around the world, alone or with partners. You would have to use your smart phone or tablet to view the trails as your ride. Luckily, the 170 has a built-in media shelf which makes this pretty easy to do. The 170 Upright can also connect to the free Schwinn Trainer app through bluetooth for tracking all your workout metrics. You can also connect with the more popular fitness apps, such as MyFitnessPal, GoogleFit, and Apple Health. There is a speaker installed directly in the console. With the mp3 port, you can connect and listen to your motivational tunes directly from the bike. Theres also a USB port for charging your smart phone or tablet while you ride. You could even charge your device while you use the RideSocial app. The 170 includes a 3-speed cooling fan to help keep you comfortable during your workouts. I like the workout fans because you can pretend it’s the open breeze on your face while you’re riding outside. You can also save 4 different user profiles on this exercise bike. This is actually pretty good considering the price range we are in here. A lot of the budget bikes don’t offer any saved profiles, and if they do, it’s usually limited to 2. 4 is a generous feature. Helpful if you have multiple family members using the same exercise bike. The 170 has a grip contact heart rate monitor in the handlebar, that’s pretty standard these days. But it is also set up for wireless heart rate monitoring- this is something usually reserved for the more expensive fitness bikes. One isn’t included, so you would have to buy your own separately. Lastly, there’s a water bottle holder attached to the frame. Let’s make sure you stay hydrated on those long rides! Putting the Schwinn 170 together is pretty straightforward. You are basically installing the base stabilizers to the base (duh), adding the mast to the base, attaching the handlebars and console to the mast, and then adding the seat and pedals. The most complicated part is probably fishing the console wire through the mast, but that isn’t too bad. The instructions are easy to follow and all of the required tools are included. Most users agree it can be assembled completely in less than an hour. It can also be put together by one person. The 170 Upright has a max user weight limit of 300 lb. I prefer home fitness equipment to have at least a 300 lb weight limit because it indicates quality construction. Budget machines tend to have lower weight capacities because they are constructed out of cheaper, less durable materials. With a 300 lb weight limit, the 170 will be able to comfortably accommodate most users. In this price range, it’s common to see bikes with 250-275 lb limits. For this price range, this warranty is about what we should expect. Nothing too surprising here. Higher-end bikes will come with a lifetime frame warranty. The takeaway here for me is: Schwinn is putting enough of a warranty on this product to let us know it’s not a piece of junk, but it’s probably not going to last forever either. Last, but maybe most importantly, is price. The Schwinn 170 normally costs about $450, give or take. If you get lucky, you might find it on sale for around $400. Regardless, I think we can all agree this falls somewhere in the budget category. You can obviously find home exercise bikes that are a lot cheaper, but you may not bee too happy with what you get. You have to be careful with buying budget equipment and you have to be realistic about your expectations. The Schwinn 170 is a good example of a quality exercise bike that happens to be priced exceptionally well. It offers a lot of the same features and qualities the more expensive bikes offer, but it comes in well under $500. Overall, I think the Schwinn 170 Upright Exercise Bike is a smart buy. It’s reasonably priced and can offer some of the more advanced features you don’t always see on bikes in this price range (like telemetry heart rate monitoring and bluetooth). It also comes from one of the most trusted names in home exercise bikes. Is the 170 perfect? No. But nothing is. It could use a heavier flywheel and a larger, more comfortable seat. But this upright bike can deliver in the categories that are most important for most of us- it’s built sturdy, easy to use, and has enough workout programs to keep us interested. The 170 Upright has become one of the most popular home fitness bikes over the last couple of years. Users tend to agree that for the price, this exercise bike is hard to beat. It even made my list for the top stationary exercise bikes of the year.